After spending six weeks studying and practicing pharmacy in Perugia, Italy, three Duquesne University Mylan School of Pharmacy students returned to campus last week with a fresh perspective on pharmacy in the United States and memories to last a lifetime. "The most exciting part of the trip (was) traveling experience and meeting new people, especially the Italian pharmacists and professors," said Brianna Antonucci, a PYIV student in the Mylan School of Pharmacy. "Everyone (was) so nice, helpful, and accommodating. Building international professional and personal relationships with these pharmacists has been a great experience." 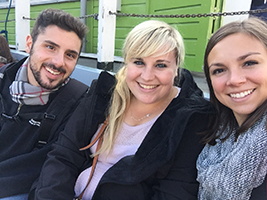 In Perugia, Antonucci and fellow PYIVs Anthony Elia and Nicole Pavlik worked with and learned from Italian pharmacists every day, observing Italian pharmacy practice and practicing a few new, useful skills. For example, Italian pharmacists spend a lot of time compounding products, and the students learned to make common Italian compounds not frequently used in the United States. "Italian pharmacists are excellent at compounding and taught us many skills on how to manipulate products," Antonucci said. Additionally, watching "Pepe," a robot designed by a company based in Milan, make a variety of products used in chemotherapy treatments proved to be a unique experience on the trip. However, the students noticed some major differences in pharmacy practice in Italy. Barriers of entry into the profession include four years of unpaid training after graduating from college. Antonucci also noted less advocacy compared to the United States and brought back a renewed sense of passion and appreciation for working with professional pharmacy organizations like the American Pharmacists Association and the Pennsylvania Pharmacists Assocation in the United States. "I am so blessed to be able to practice pharmacy in a country where pharmacists are well respected and are able to practice clinically," Antonucci said. "I never realized just how lucky we are as pharmacists in the United States to practice pharmacy the way we do until being abroad; this is something I will never take for granted again." The students observed Italian pharmacy classes and labs, traveled through Western Europe, and built relationships with Italian pharmacists, preceptors and professors. The students hope the relationships forged in Italy last beyond the study abroad experience. "We are already hoping to either make a return trip to Italy in the near future or having the pharmacists come to Pittsburgh to visit us," Antonucci said. The Duquesne University Mylan School of Pharmacy strives to give students opportunities to step outside the lab and classroom with programs like the study abroad trip to Perugia. Welcome home, Brianna, Anthony and Nicole!